The first day of the WFSC 2015 started with the Battle Junior Men discipline. The junior category in battle is introduced this year for the first time in the world championships. Nathan Menard (Fra), Shibagaki Masayoshi (Jpn), Zhang Hao (Chn) and Valerio Degli Agostini (Ita) were competing in the Big Final. 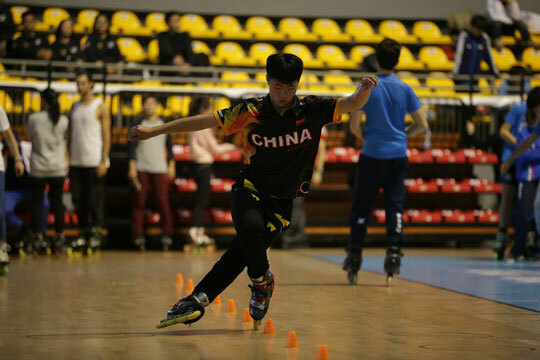 The Battle World Champion 2014, Zhang Hao, just confirmed everyone's expectation and won the Big Final! He performed very technical and clean runs. This is his second World Champion title in a row. "I am very happy with my victory" Zhang Hao shared his feelings, "It's so exciting! I was very surprised by many skaters, who improved so much. I will do my best to get one more World Champion title in the Classic." "This is my first World Championships" he said, "and i feel very happy with my second place. I knew there were many strong skaters as Zhang Hao, Nathan Menard and others so i just tried to do my best during my runs. I would like to thank my team and my coach for their support!" French skater, Nathan Menard took the bronze medal of this championships. "I was so happy to skate in the final! - said Nathan. Bronze medal is a good result for me, i am very satisfied with my result". Shibagaki Masayoshi finished at the fourth place. This is his best result so far!